SEASON 2, EPISODE 1-"WAITING FOR DUTCH"
Joel and Ethan Coen's "Fargo" from 1996 was one of the finest motion pictures of the 1990's and one of my personal favorite films of all time. I have loved the movie so much that I accidentally wrote about it twice on my Essentials column. Its a great movie, so when I heard FX was going to make a television series based on the movie, I was all for it. I was totally excited for it. I could not wait to get my eyes onto it. The first season of "Fargo" on FX was amazing. It was not just good, it was not just great, it was amazing. I will get the first season eventually. I will watch it more than once, I am sure. I loved the cast that included Billy Bob Thorton, Martin Freeman, Kate Walsh, Allison Tolman, Colin Hanks, Bob Odenkirk, Glenn Howerton and Oliver Platt. I loved how the show mimic the themes and ideas of the movie, but stood on its own two feet. I am noticing lots of shows based on movies, toys, or other pop culture is they use their inspiration as a crutch, unable to be anything of its own. That definitely was not the case for "Fargo." I was intrigued by the idea of "Fargo" being a anthology series, because they are on a rage right now. "American Horror Story" and "True Detective" are proving that people may like shows that are mini-series' each year, and it seems "Fargo" is ready to follow suit. This second season carries some of the themes from the movie and first season. It still tries to convince the audience that its based on a true story. There are some murders and a small-town, Minnesota cop hot on the trail. Did I mention murders? Because in this season premiere there are three murders in the first fifteen minutes. But that's pretty much it. 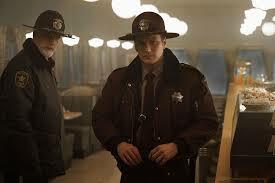 I felt that the first season of "Fargo" was a remake of the movie in lots of ways. I already love that this second season tries to be something different. We have a family, featuring Jeffrey Donovan and Jean Smart, who use extortion to make money. They send their youngest son (Kieran Culkin) to intimidate a judge. Not only does he kill the judge, but two witnesses. Once Culkin's character is fleeing the scene, he is run over by a car. Landing on the car, it drives away with Culkin still on the hood. This leads us to Trooper Lou Solverson (Patrick Wilson) to take the case. Then we meet Ed and Peggy Blomquist (Jesse Plemons and Kirstin Dunst), its Peggy who hit Culkin and Ed ends up killing him in self-defense. Now they have a dead body they don't know what to do with. There is also a rival gang who wants the crime family's territory. This group is headlined by Brad Garrett and Bokeem Woodbine. There is much more going on this season. The characters for Wilson, Donovan, Smart, Plemons, Dunst, Garrett and Woodbine seem absolutely superb. There are also seemingly great roles for Ted Danson, Nick Offerman, and Rachel Keller. Oh, and Bruce Campbell playing President Ronald Reagan, can't wait!